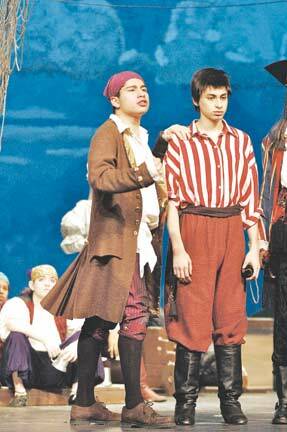 Hector Ochoa (left), an ESOL 4 student, plays the part of "Samuel1" in The Pirates of Penzance. With him is Diego Ardila who plays the part of "Frederick." When I started school in the U.S. at Blair last year, I didn’t think it was possible to dream about the events of my second year at Blair. 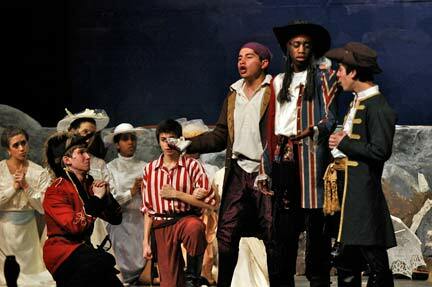 But this year I feel lucky to be part of the school play, “The Pirates of Penzance” which was presented this spring. This marvelous experience for me actually began in the cold winter of last December when our school players performed a play from the Charles Dickens novel named “A Christmas Carol.” After I saw the first performance on opening night, I talked with Mr. Kaluta, the teacher in charge of the stage crew. I already knew him because he was my teacher in a Technology Innovations class. We talked about the performance that I really enjoyed and he asked me if I would like to be in the next play. I didn’t think about it seriously that night. However, as the days and weeks passed I started to see information in the school about the spring play and I heard about the auditions that would be in January. When the auditions were about to start, I already had the desire to participate and see what would happen. A few days before the audition I talked with Mr. Newport, a chorus teacher, who told me that I had to look at three pieces of three songs and start to practice. The audition day arrived before I could say “Pirates.” I applied for an audition and, after the bell rang at the end of the day, many students began to gather at Broadway and Renaissance Hall. I didn’t know what I was supposed to do. However I tried my best, prepared for the worst, but expected the best. After the auditions, the first meeting for actors arrived and I discovered that I was accepted, perhaps not as I wished, but accepted! I only had a small part, but I was in the play. The first rehearsals began the following weeks every day after school in room 16. At this point I can’t say that those meetings were boring or annoying because I already had seen the result of all this sacrifice. I cannot forget the day when my participation in this important play completely changed. One day in February two students dropped out of the play. One of them had the part of “Samuel” an important character in the play. The news spread like fire on a match that afternoon and I thought about what might happen with this new vacancy and who was going to replace the people who dropped out. Mrs. O’Connor, the teacher in charge of this musical who also was the director, came at 3:00 p.m. that afternoon in February. At that time she called some students to make a second audition. I and another person tried for the character of Samuel, the lieutenant of the Pirate King, who is a secondary lead character. After the auditions, Mrs. O’Connor announced that I would be sharing Samuel’s character with my tryout partner. She made two characters out of one and we shared the lines. I thought that it was fair for both of us. We practiced a lot, even on snow days. Then, when the school activities got back to normal, I realized how some actors who could go to the rehearsals during the snow dates began to help those who couldn’t be there. They helped with lines, steps and blocking. That was an act of solidarity and friendship that was helpful to everyone. The first days of March arrived with a strong sense of duty, nervousness, and work that got harder and harder every day. But everything began to become polished and slightly enjoyable. Slowly everything was coming together. After the first weekend of March, I felt more comfortable between my new friends and this new environment. I already had met a few friends. Some were Hispanic and spoke Spanish which made me feel even better. One day before the rehearsal Mr. Kaluta, who had already been working on the stage crew, came to talk with me about the possibility of improving my pronunciation. He helped me work with one of his nephews who works in radio. By thesecond weekend ofMarch we began to make a better jobworking with lines, songs, blocking and music, however a few more things had to be added. My partners and I began to use costumes for the play. We also started using microphones and practicing on the whole stageunder the incandescent lights every day after schooluntil the firstteaser in March 15. When the play opened we were all excitedly nervous, but at this point everybody knew how to calm themselves and be cool and relaxed for the presentations which we performed for two weekends. Finally the last curtain call came and we performed the play for the last time in our school. However even though we don’t perform in school anymore, we still have been busy receiving invitations to perform in different places such as the University of Maryland and at the National Institutes of Health for some children. After our performing is finished, everything will just be memories for me, memories of the 2007 Blair musical that wasn’t easy, but was worth all of the work.But I would say that it was really interesting for me, an ESOL 4 guy who is becoming more and more fluent in English. I hope that more ESOL students get involved in these kinds of activities. Hector Ochoa, who has only been speaking English for a few years, had to work hard to speak clearly enough to be understood. Someone who works in radio helped Hector with his pronunciation.